This delicious pesto pasta dish makes brilliant use of tinned tuna, fresh tomatoes and fresh spinach. Make your own pesto if you like or just use a good-quality shop bought variety. Cook the pasta according to packet instructions in a saucepan of boiling salted water. Meanwhile, chop the spinach and the tomatoes. Melt the butter in a saucepan, then add the pesto and milk and whisk constantly until boiling and properly combined. Add the tuna and spinach and simmer for 3-4 minutes. Stir in the cooked pasta and the chopped tomatoes. Serve. 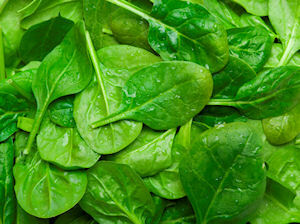 Use frozen spinach if you cannot find fresh and if you want to, use cherry tomatoes in place of plum tomatoes. Recipe serves 6. Bit bland, a nice quick basic dinner that used up spinach! This creamy pasta is an ideal midweek dinner for all the family.